At approximately 2,500 square feet, this meticulously renovated home offers an entry foyer that leads you into the large, formal living room with 9'3" ceilings, a working wood burning fireplace and double height windows looking directly over Park Avenue. Perched on the south-east corner of the building, adjacent to the living room, is the Library/Media Room, which is enhanced by dark wood and hand-crafted cabinetry and millwork. 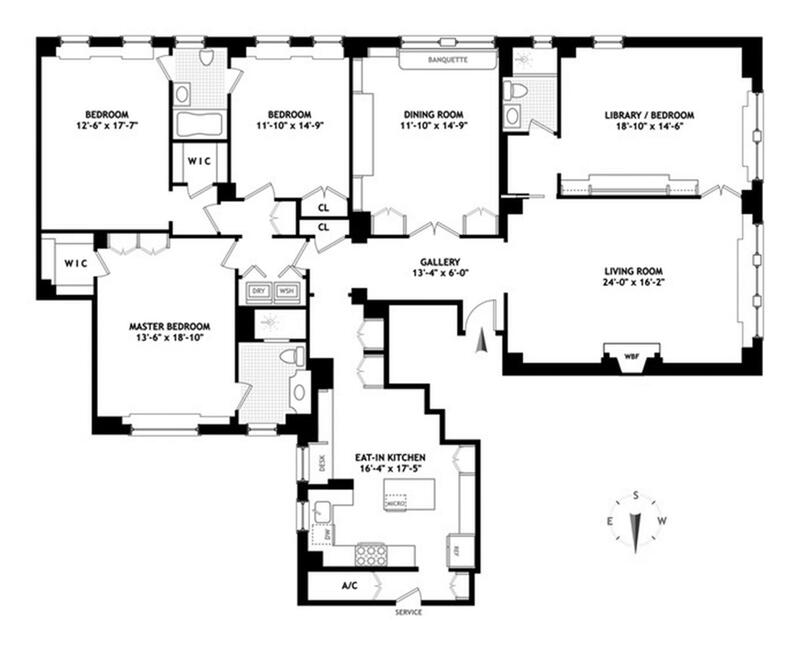 The media room offers two exposures: west to Park Avenue and south to 89th street. The eat-in chef's kitchen is sprawling with several work areas, custom cabinetry, and tons of built-in shelving. The stunning craftsmanship extends to the subzero refrigerator, Bosch dishwasher, and Wolf oven that includes a cooking canopy with exterior ventilation. A separate, formal dining room enclosed double French doors with beautiful built-ins and a window seat with built in storage overlooking 89th Street and Park Ave allows you to entertain a large dinner party. The three bedrooms all sit on the east side of the home. The master bedroom with ensuite bathroom features its own master dressing room, large closets and plenty of space to relax. There are two additional bedrooms attached by a shared bathroom both with southern exposures, and large closets The hall closets, are also large and are outfitted with a laundry room with high-capacity vented washer/dryer. This apartment leaves nothing to desire in grand comfortable living. The library or formal dining can be used as a 4th bedroom. Ultra-bright and grand, this meticulously renovated apartment is located in one of Park Avenue's most sought after Rosario Candela buildings. Candela was well known for his wonderful, livable layouts and beautiful details. This white-gloved, full service, pet friendly Co-op offers residents a gym and private storage for each home. In the heart of Carnegie Hill between 88th and 89th Streets The building is 14 stories and has 58 apartments. Converted to a cooperative in 1951, it is considered a fine Park Avenue address, and is known for it's excellent service.